MANAMA (Reuters) – Bahrain’s main Shi’ite Muslim opposition group said on Tuesday the interior ministry had summoned its leader for interrogation after he met a visiting U.S. official who was subsequently ordered to leave the kingdom. Bahrain is a ally of Washington in a volatile Gulf region and has long provided a base for the U.S. Navy’s Fifth Fleet. But at the same it has faced American criticism over its record on human rights since crushing a popular uprising in 2011. Sheikh Ali Salman, secretary-general of al Wefaq and his political assistant Khalil al-Marzooq, were summoned by Bahraini authorities after a meeting they had with the U.S. Assistant Secretary of State for Democracy, Human Rights and Labor, Tomasz Malinowski, a spokesman from Wefaq told Reuters. On Monday, Bahrain ordered Malinowski to leave for having “meetings with a particular party to the detriment of other interlocutors, thus discriminating between one people, contravening diplomatic norms and flouting normal interstate relations”. It remains unclear if Malinowski has quit Bahrain. A Wefaq spokesman said Bahraini authorities intended to question Salman on Wednesday morning and no reason had been given for the move. No one from Bahrain’s ministry of interior was immediately available for comment. Wefaq has called for a constitutional monarchy in the small Gulf Arab kingdom with a government chosen from within a democratically elected parliament. Bahrain, long ruled by the Sunni Muslim al-Khalifa family, still faces frequent low-level unrest more than three years after the authorities quelled Shi’ite-led demonstrations for democratic reform. Bahraini Shi’ites, who make up the majority of the population, complain of political and economic marginalization, an accusation the government denies. 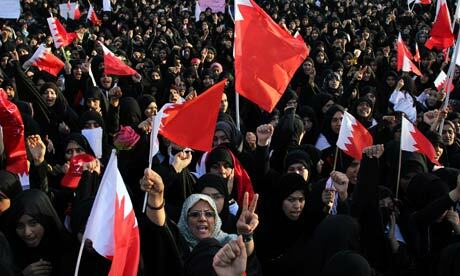 The U.S. government said on Monday it was “deeply concerned” about Bahrain’s demand for Malinowski’s departure. It said his visit had been coordinated with Manama in advance and that its government was “well aware” that visiting U.S. officials typically meet with different political groups.